If a rehabilitation program is to achieve a strong base in the community, it needs to involve large numbers of local children. There are many important ways in which village children of various ages can take part, playing and working together with disabled children. We have already discussed how children can help build a low-cost 'playground-for all children'. Another way that village children can contribute to a rehabilitation program is by helping to make special toys for disabled babies and children. In Project PROJIMO in Mexico, village children help out in this way-and enjoy doing it. 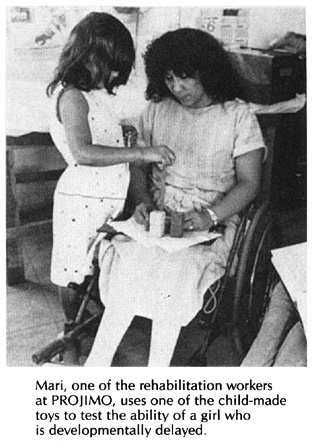 In addition to the toys that this voluntary 'labor' produces, it also brings together non-disabled and disabled children in a creative work-play relationship. At first the children at PROJIMO made toys in the same workshop where the disabled staff was busy making braces, wheelchairs, and other orthopedic equipment. But soon things got too crowded. The children often played while they worked (which is natural), and a few important tools got broken or 'lost'. While there were advantages to letting the children work in the same shop with skilled disabled craftspersons, the team finally decided to create a separate 'children's workshop' equipped with its own basic tools. In this workshop, children are invited to make educational and useful toys -'useful' in the sense that they help with a child's early development, providing stimulation, exercise, use of the senses, and learning of skills. PROJIMO has an agreement with the children. 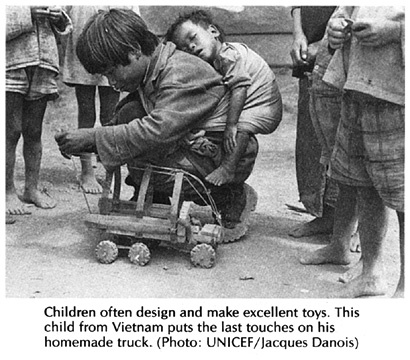 The first toy they make is for the rehabilitation centeror for a particular disabled child. The second toy they make they can take home for a younger brother or sister. 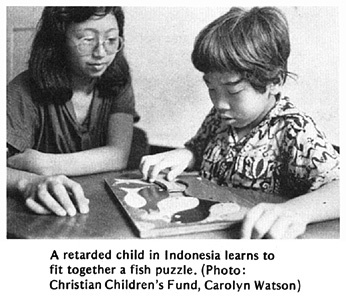 In this way PROJIMO and the school children also contribute to the development of non-disabled children in the village. Another advantage to the children's workshop is that it provides experience, fun, productive activity, and skills training for visiting disabled children. Thus a child who needs to spend a few days in the village, while a brace or limb is being fitted or a joint is being straightened, can spend part of his free time in the workshop. The orthopedic workshop is not strictly off-limits for the children. Occasionally a child who proves to be a responsible and serious worker will be allowed to help in the 'adult workshop'- perhaps helping to make crutches, braces, special seats, and other orthopedic equipment. But to gain working privilege in the 'big persons' shop, a child must usually first prove himself in the children's workshop. This helps reduce problems. But, of course, some problems do occur-as with any community action that is worthwhile. Guiding and coordinating the children's workshop (we prefer 'guiding' to 'supervising') is an important job. It can be shared by different persons: rehabilitation workers, volunteer village craftspersons, or even some of the older, more responsible children as they gain experience. What is most important for such a coordinator is (a) that she like children,(b) that she be able to provide direction and keep order effectively without being bossy, and (c) that she be very patient. Whether parents of visiting or local disabled children are invited as coordinators or helpers in the children's workshop can be decided depending on the particular parent and child. Some parents do a fine job. It may be an opportunity for a parent to relate to and work with his child in a completely new way. However, some parents may continue to overprotect and over-direct their own child or other children in the workshop. Many children need a chance to do and make things with other children independent of their parents' supervision or help. For such children, it may be best not to ask their parents to be present in the workshop. Here are some suggestions for basic equipment. You will want to consider what tools are commonly used and least expensive in your area, and equip the shop accordingly. Workbenches. You will probably need at least 2, at different heights. One should be just high enough for the local size of children's wheelchairs to fit under. (Unfortunately, many children are given adult-size wheelchairs with high armrests. These often do not fit under a bench at a good height for working.) Make workbenches strong enough so they do not move a lot. A sewing machine (foot-powered or electric) will also be helpful in making many toys, dolls, and clothing. If the program can afford it, this machine can speed up sewing greatly, and help children learn an important skill. CAUTION: Be sure children and all workers use goggles (protective glasses) when using tools where bits of wood or metal could injure eyes. 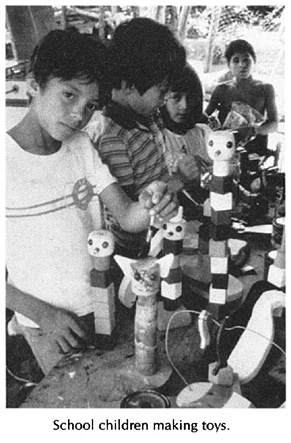 Many materials for making toys can be gathered from local foress- branches of trees, reeds, bamboo, wild kapok (cotton). Also various nuts, seedpods, and seashells can be used. Broken fruit-packing boxes often have thin wood that is excellent for toy-making. Even the nails can be pulled out, straightened and re-used. Old tubes of car and bike tires provide elastic bands for many toys. Scraps of wood, wire, and other supplies left over by lumber stores, builders, etc. will often be donated if you explain why you want them. Clothing makers and factories may have scraps of cloth left over. Cardboard cartons, especially thick ones (even if broken) provide material for making many toys. Ask in local shops. Old cans, tins, plastic bottles, thread spools, and so on are also useful. Ask members of the community to look for and collect these and other supplies. In a community rehabilitation program it is essential to have lots of toys-different playthings for children at different levels of development who have different strengths, weaknesses, and interests. Many of the most fun, most educational toys can be made from scrap materials by members of the family or community. Disabled children with good hands can learn skills and take pride in making toys for other disabled children. So it makes sense to make toys rather than to buy them. Spend money on TOOLS, not toys. The following pages show a number of toys that children will enjoy making in a children's workshop. Or disabled children or their families can make them at home. We start with very simple toys for babies or children at an early developmental level. Gradually, the toys become more advanced. More skills will be needed by the children who make them, and by those who play with them. IMPORTANT: Please don't just copy the ideas for toys shown here. Be creative. And encourage the children making the toys to be creative. Help them use the examples shown on these pages as triggers to the imagination. Have fun! CAUTION: Be sure not to use things that are poisonous, harmful, or that might get stuck in the child's throat, nose, or ears. For a baby, hang a ring of beads' where she can reach and handle it. A child can play putting the nuts and pods in and out of a container. Later he can learn to sort them -first by seeing them, and then blindfolded. As the child develops more hand control, she can begin to make chains and necklaces by stringing the nuts on a cord. 'Snakes' can be made by stringing nuts, 'caps' of acorns, bottle caps-or any combination of things. If you use your imagination, there are all kinds of toy animals you and your children can have fun making. Cut a round hole at the stem and clean out the seeds and flesh. Let it dry out well. Put 2 or 3 small rocks, rubs or other objects inside. Find a stick the size of the hole. If the hole is large, thin down this part of the stick. Glue the stick to the gourd. To make it stronger and better looking, mix white glue and sawdust, fill in here, and after glue dries, sand it smooth. If the child drops or throws his toys, try attaching strings and help him learn to get them back by himself. or use 2 small bells. Cut a colorful soft cloth (flannel) this is shape. Sew it into a square and turn inside out. Place can or bells in cloth square and pack wild kapok, cotton or bits of sponge around it. Sew it shut. Draw a doll on 2 pieces of cloth, and cut them out. Turn the doll inside out. Sew or draw on a face. Cut 3 pieces of cloth of one color. and 3 pieces of another color. Sew them together except for a small hole. Turn inside out and stuff. Children can improve hand control, learn to count, and learn about money by playing with coins and the piggybank. Cover with papier-mâché and attach 'feet' and 'hands'. When dry, cut out mouth and paint. The frog can be used as a handy storage container or cookie jar. Children who need to develop hand control can play 'feed the frog' - taking objects in and out. Note : For the pig and frog, you can use a large gourd instead of a balloon. Games fitting pegs or blocks into holes help develop better hand control and 'hand-eye coordination'. They also help the child learn to compare sizes, shapes, and colors. To help develop fine control of hand movement, blocks, beads or animal figures can be moved along a wire. Children with poor control need only move the figure from one side to the other. Children with good control try to move the figure without touching the wire. The more bends you put in the wire, the harder it is. The gourd baby is fun because it can be given drinks and then 'go to the latrine'. Thus it can be a good tool for 'toilet training' children. For other ideas and dolls for toilet training, see Page 341. With these, children learn about matching colors, shapes, and sizes. This wooden donkey or horse with a clothes-pin head is fun to make and to play with. It can also be used as a note or reminder holder. Perhaps disabled children at the rehabilitation center can make this to sell for pocket money. Trace the donkey onto a piece of wood about as thick as the clothes-pin (1 cm). Cut it out with a jig saw. Also make a base, as shown. Sand pieces smooth and glue together. Cut a pattern of the bear out of a wood board about 2 cm. (3/4 inch) thick. Hang a stick from the roof or a tree limb. By pulling one cord and then the other, the bear will climb the ropes! Children love it! Good for developing use of both hands together. Use it to help the child enjoy bathing, develop hand control, and even speech. Use an old spool or corncob. For more fun, place a paper cone over the creeper, and decorate it to look like a person or animal. This simple noise toy can be made completely of waste material. The pin mounted at the front scrapes against the inside of the bottlecap-and the cups amplify the noise like the loud-speakers of a record player. Children can first learn to form one flower. Later, they can play 'sorting games' with flowers of different colors. Several children can play to see who can complete a flower first-using dice with different colored sides. First have the child build the main object (here, the owl) with a few pieces. Later, she can learn to fill in the background. 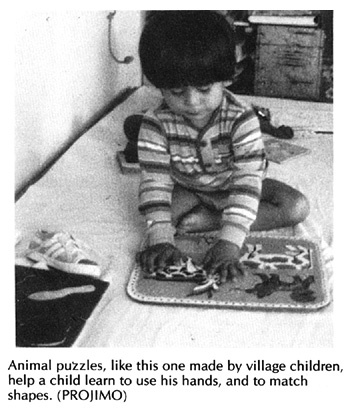 Suggestion: If you have a large photo of the child or a family member, glue it on cardboard and cut out the puzzle. Or use a picture from a magazine or calendar. Glue 6 different pictures to the sides of a thick board or sheet of foam plastic, and cut it into blocks. You can also make blocks from cubes of clay or small match boxes. Ideas for the toys shown in this chapter are from many sources, including books. For books on toys and games, see Page 641. Other toys are on pages 253, 317, 318, 341, 347, and 392.